You are currently browsing the tag archive for the ‘Monkey Magic’ tag. In a couple of hours I am off to Armageddon in Sydney’s Olympic Park. Nerd nivana. Will I ask John Rhys Davies to say ‘bad dates‘? Will I convince Lance Henriksen to do the knife trick from Aliens? Will I manage to stop myself from geeking out when I meet Gail Simone for the first time? All of these things are doubtful. So for today’s review I have chosen a comic book – but given the day that is in it, with Armageddon no doubt featuring plenty of promotions of upcoming superhero comics, movies, toys, it occured to me that if I must review a ‘graphic novel’, I see no reason why I should restrict myself to the caped brigade. Comics are a medium just like any other, a method of story-telling that combines text and image. Why on earth are there so many comics are people punching one another really hard? 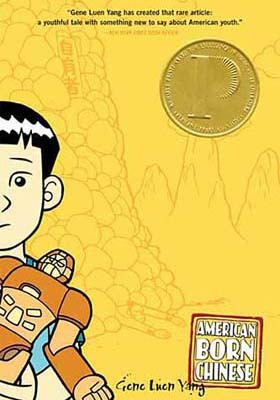 While Gene Luen Yang does introduce several fantastical elements into this tale of growing up Asian American, at its heart it is a story about a kid not able to fit in, who chooses to reject and hide from his culture in order to become more ‘normal’. However, to get back to magic and fantasy, our story begins with a summary of the traditional Chinese myth, Journey to the West. The minor god Monkey wants to join the other deities in Heaven at a lavish banquet, but is rejected because he is just a monkey. In a rage the little god attacks and defeats his social betters. Over the years he becomes even more capricious, inventing new titles for himself and daring to antagonise the Almighty, Tze-Yo-Tzuh. For his hubris, Monkey is punished and buried beneath a mountain. Jin Wang’s mother told him the tale of Monkey. To him though it is just another story from China, another thing that sets him apart. Bullied by the other children at school, he is desperate to be accepted, even tolerating the ‘friendship’, of a boy who physically abuses him. One day another student, Wei Chen Sun, arrives from Taiwan. Jin seizes his chance to finally become the bullier, raise himself up through the social pyramid by belittling another student. Instead, he finds himself becoming Wei’s best friend. Now if only he could work up the confidence to ask the beautiful and blond Amelia Harris out on a date. A third story thread mixes the realism of Jin’s adolescent angst and the fantastical excesses of Monkey’s tale, involving an all-American boy named Danny, who is embarrassed when his distant cousin, Chin-Kee, arrives to visit. Followed everywhere by his cousin, who spouts stereotypical racist dialogue, can grow in size and insists on drawing attention to Danny’s relationship with him in a humiliating fashion, any hope he has of being popular quickly vanishes. Chin-Kee is a monstrous manifestation of the contempt Jin sees directed to him by the other children at his school. As the three stories continue we discover how they are inter-related, how Monkey, Jin and Danny are in fact all connected. When I was a kid growing up in Co. Dublin, I was obsessed with the Japanese show Monkey Magic which shares the same mythological source material as this book. Emmet at age five just saw it as an entertaining program and used to swing from the bicycle railings outside of school singing the theme song. So I am familiar, albeit in a distant fashion, with some of the fantastical elements Yang employs in American Born Chinese. I also, however, grew up an outsider, bullied in school, not able to fit in and reading this book brought all of that back to me. I love how Yang links these autobiographical elements of growing up in America with the more supernatural and religious aspects of the story, representing an overall metaphor for the cultural differences thrown up before a young Chinese boy. The story is also wickedly funny, quite sweet at times and well paced. This is an excellent book, well told by a confident and imaginative story-teller. Fantastic. Right, now I’m off to geek it up.